On New Year’s Eve an extra second will be added to the end of the day. This extra second is called a leap second. As I’ll explain later, leap seconds need to be added periodically to bring the time we measure with accurate atomic clocks in line with the natural time which results from the rotation of the Earth. Although we take the average length of a day to be 24 hours, the mean solar day, or average “natural” day measured by the Earth’s rotation, is now slightly longer than this. As discussed in a previous post, this is due to the slowing down of the Earth’s rotation (see note 1). In the year 1900 a day was almost exactly 24 hours, but it is now around 24 hours 0.001 seconds. So, to bring the time measured by accurate atomic clocks to within a second of the natural time, a leap second needs to be added approximately every 1,000 days. The extra second is always added at the end of the day on 30 June or 31 December. The previous two were added on 30 June 2012 and on 30 June 2015. This variation means that, unlike leap years, where there are precise rules for determining whether or not a given year will be a leap year, it is not possible to say years in advance when there will be a leap second. A body called the International Earth Rotation and Reference Systems Service (www.iers.org) decides from accurate measurements of the Earth’s rotation when the next leap second will occur. This announcement is made around six months in advance. 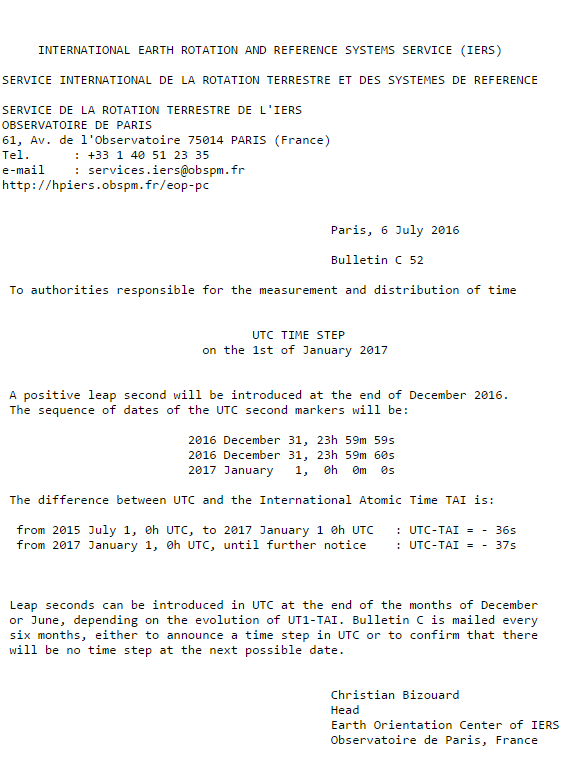 For example, the official announcement of the December 31 leap second was made on 6 July 2016 by the following bulletin. In the past when leap seconds have been applied, a number of data centres and websites around the world experienced system problems and crashed. This was because they could not cope with a minute which contains 61 seconds and interpreted this unforeseen event as a system failure. What will happen in the longer term? As the length of the day gradually increases, leap seconds will need to added more often. In 100 years time we will have, on average, a leap second once a year and in 1,000 years time we will have 7 leap seconds per year, which is equivalent to one leap second every 52 days. 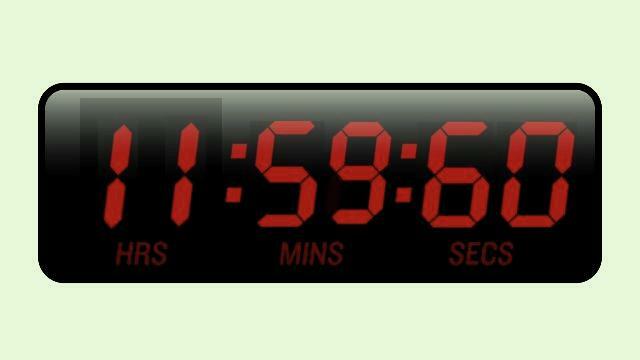 When will the leap second be added? The extra second is inserted at 23:59:60 at 31 December 2016, Greenwich Mean Time (GMT) (see note 2). So in the UK which uses GMT in the winter months, it will occur just before midnight. In different parts of the world the leap second will be added at different local times. New York is 5 hours behind GMT, so the extra second will be added at 18:59:60 on 31 December local time. Beijing is 8 hours ahead of GMT and the extra second will be added at 07:59:60 on 1 January. Use it wisely ;-). 1)The average length of day when calculated over a entire year is just over 24 hours. However, over the course of a year the the actual length of a solar day varies. This variation throughout the year is due to entirely different effects than the slowing of the Earth’s rotation. It is at its longest – 24 hours and 30 seconds – around Christmas day and it is shortest at around 23 hours 59 minutes and 38 seconds in mid September. This is variation is described in more detail in my post September 18 the shortest day. 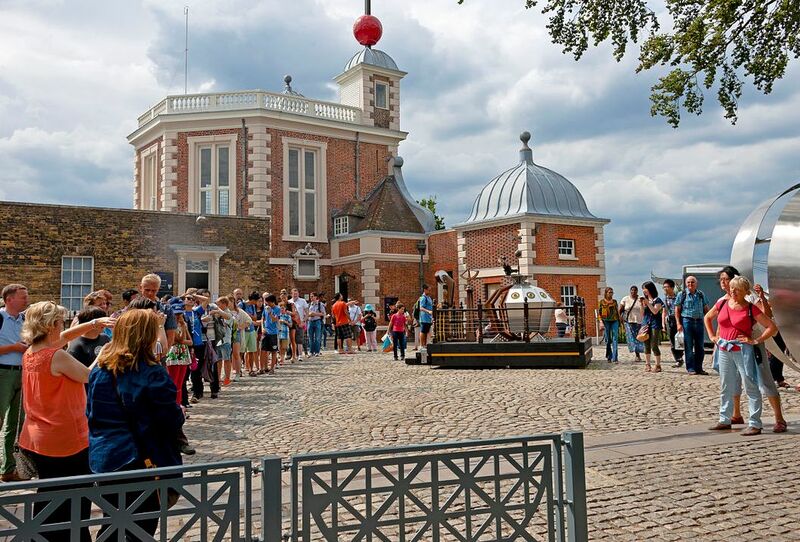 2) The term Greenwich Mean Time is no longer used by astronomers. Instead, they use two different times which agree with each other to within 1 second. In common use, Greenwich Mean Time (GMT) is often taken to be the same as UTC, which is the approach I have taken for this post. However, it can also be taken to mean UT1. Owing to the ambiguity of whether UTC or UT1 is meant, and because timekeeping laws usually refer to UTC, GMT is normally avoided in precise writing. Google. Making every (leap) second count with our new public NTP servers. https://cloudplatform.googleblog.com/2016/11/making-every-leap-second-count-with-our-new-public-NTP-servers.html (accessed 7 December 2016). Next Post Christmas Day – December 25th or January 7th? Could this account for the “global warming” everyone keeps talking about? So, ultimately, will the earth stop turning completely? For billions of years the Earth’s speed of rotation has been gradually slowing down as its rotational energy is transferred to the Moon causing the Moon to spiral away from the Earth. (Experimental equipment left on the Moon by the Apollo astronauts has confirmed that the average distance from the Earth to the Moon is increasing by about 4 cm a year.) In theory an equilibrium would be reached where the Earth rotates on its axis in exactly the same time as the Moon takes to orbit the Earth and the slowing would stop. And people are upset that I set my clocks 2 minutes fast. Can’t wait to say “I told you so” in just a few short centuries. This was a really interesting read! Thanks for doing the research. Well that’s a lot more complicated than I realised. Thanks for drawing the post to my attention – interesting!